che se po dvori ne vizhda. Ti si mi, Stoyne, momata. 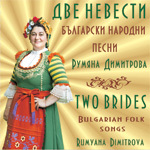 Тrack No:: 4 - Duration: 2'08"
The first music album of folk singer Rumyana Dimitrova includes 9 Bulgarian folk songs.